From CNN April 30, 2012. “As a federal court prepares to rule on a challenge to Sirhan Sirhan’s conviction in the Robert F. Kennedy assassination, a long overlooked witness to the murder is telling her story: She heard two guns firing during the 1968 shooting and authorities altered her account of the crime. Nina Rhodes-Hughes wants the world to know that, despite what history says, Sirhan was not the only gunman firing shots when Kennedy was murdered a few feet away from her at a Los Angeles hotel. “For me it’s hopeful and sad that it’s only coming out now instead of before — but at least now instead of never,” Rhodes-Hughes told CNN by phone from her home near Vancouver, British Columbia. The U.S. District Court in Los Angeles is set to rule on a request by the 68-year-old Sirhan that he be released, retried or granted a hearing on new evidence, including Rhodes-Hughes’ firsthand account. At his 1969 trial, Sirhan’s original defense team never contested the prosecution’s case that Sirhan was the one and only shooter in Kennedy’s assassination. Sirhan testified at his trial that he had killed Kennedy “with 20 years of malice aforethought,” and he was convicted and sentenced to death, which was reduced to life in prison in 1972. “In a response also filed in federal court in Los Angeles, the defense team led by New York attorney William Pepper contends that the FBI misrepresented Rhodes-Hughes’ eyewitness account and that she actually had heard a total of 12 to 14 shots fired. “She identified fifteen errors including the FBI alteration which quoted her as hearing only eight shots, which she explicitly denied was what she had told them,” Sirhan’s lawyers argued in February, citing a previously published statement from Rhodes-Hughes. In this NBC photo taken in 1965, TV actress Nina Roman, today known as Nina Rhodes-Hughes, left, and her “Morning Star” co-star Elizabeth Perry, right, meet Robert F. Kennedy at NBC’s Burbank studios. Two and a half years later, Rhodes-Hughes witnessed Kennedy’s assassination.The FBI and the California attorney general’s office both declined to comment to CNN on the controversy over Rhodes-Hughes’ witness account since the matter is now being reviewed by a federal judge. Rhodes-Hughes was a television actress in 1968 who worked as a volunteer fundraiser for Kennedy’s presidential campaign. Rhodes-Hughes, now 78, tells CNN she informed authorities in 1968 that the number of gunshots she counted in the kitchen pantry exceeded eight — which would have been more than the maximum Sirhan could have fired — and that some of the shots came from a location in the pantry other than Sirhan’s position. Robert Kennedy was the most seriously wounded of the six people shot inside the hotel pantry on June 5, 1968, only moments after the New York senator had claimed victory in California’s Democratic primary election. The presidential candidate died the next day; the other victims survived. The Los Angeles County coroner determined that three bullets struck Kennedy’s body and a fourth passed harmlessly through his clothing. Police and prosecutors declared the four bullets were among eight fired by Sirhan acting alone. Rhodes-Hughes tells CNN the FBI’s eight-shot claim is “completely false.” She says the bureau “twisted” things she told two FBI agents when they interviewed her as an assassination witness in 1968, and she says Harris and her prosecutors are simply “parroting” the bureau’s report. “When they say only eight shots, the anger within me is so great that I practically — I get very emotional because it is so untrue. It is so untrue,” she said. — Estelyn Duffy LaHive, who had been a Kennedy supporter, told police that she was standing just outside the kitchen pantry’s west entrance when the shooting erupted. “I thought I heard at least about 10 shots,” she told the LAPD. — Booker Griffin, another Kennedy supporter, told police that he had just entered the pantry through its east entrance and suddenly heard “two quick” shots followed by a slight pause and then what “sounded like it could have been 10 or 12” additional shots. Obama and the left continue to demonize oil companies, foster class warfare with lies of taxing the rich and destroy the US economy with their socialist anti business agenda. From Citizen Wells April 3, 2012. “Senate Republican Leader Mitch McConnell of Kentucky, in an e-mailed statement, said Obama’s proposal is a political gambit in an election year and called the plan a “tax hike on American energy manufacturers” that he’d oppose. “And how big are the oil company profits? Compare these profit margins to other industries. “Companies (corporations, LLC’s, partnerships, sole proprietors) do not paytaxes! Consumers pay for the tax increases. Taxes are part of the cost of doing business. Has Obama and the left been questioning Apple? Apple’s profit margin is 29.66 percent with net profits of $24.7 billion on revenues of $85.5 billion in the first half of the fiscal year. Is Apple paying it’s fair share of taxes? From the NY Times April 28, 2012. “Apple, the world’s most profitable technology company, doesn’t design iPhones here. It doesn’t run AppleCare customer service from this city. And it doesn’t manufacture MacBooks or iPads anywhere nearby. Citizen Wells has been writing for some time about the impact of high gas prices and taxation on the economy. One of the most important ideas presented here is the fact that companies do not pay taxes, consumers do. “First, the corporate tax rate in the US is near or at the top in the world. US oil companies pay enormous amounts of taxes. How does this compare to one of Obama’s pay to play buddies GE? Check this out for yourself. Here is the really important point about raising taxes on oil companies and other companies. Companies (corporations, LLC’s, partnerships, sole proprietors) do not pay taxes! From McClatchy News April 27, 2012. ““I think what it says is consumers are coming back a bit, but firms are still holding back. They don’t feel confident enough in the recovery to start adding to capacity” and expanding, said Bill Craighead, an economics professor at Wesleyan University in Middletown, Conn. Consumers appear to be making up for cautious spending in recent years, more confident that the worst is over, he suggested. The same can’t be said for American businesses. From McClatchy News April 23, 2012. “The U.S. economy is expected to slow later this year, dragged down by slowing global growth, rising anxiety about the elections and the specter of gridlock in Washington over urgent tax, spending and debt deadlines. The Bush-era tax cuts of 2001 and 2003 and the payroll tax cut of the past two years expire at year’s end, when last year’s debt deal also will force across-the-board cuts in federal spending unless Congress and the president strike new deals, but there’s no consensus on that. A spate of recent indicators punctuated fears that the economy is stalling. March delivered only 120,000 new jobs, and the latest manufacturing and real estate data softened. Some economists say the economy’s strong six-month run through March might not be sustainable. “Recent U.S. data have been discouraging for what remains the world’s largest economy. In the two weeks after the April 6 release of the weak March employment numbers, first-time jobless claims rose. The Labor Department said last Thursday that the four-week average for unemployment claims stood at 374,750 _ the highest since January. Additionally, the job placement firm Challenger, Gray & Christmas reported earlier this month that employers announced 9.4 percent more layoffs in the first three months of this year than the same period last year. Last year’s numbers, however, were the smallest number of layoffs since 1995. It all points to slower hiring. “Were we on the verge of a breakout? I think the answer is no,” said Kevin Logan, the chief U.S. economist for the global bank HSBC. Noting that the economy is adding jobs in a monthly range of 100,000 to 200,000, Logan expects hiring to bump along the bottom. “The next few months, we’ll fall back into this slower pattern,” he said, adding that several drivers of the U.S. economy remain impaired. From CBS Los Angeles April 27, 2012. “An official with the Los Angeles County coroner’s office may have been poisoned with arsenic, police said Friday. After Cormier’s body was back at the county morgue where he worked until last week, toxicology tests are being run to determine the cause of his death. To the best of my knowledge, Debbie Schlussel was the first investigative journalist to question Obama’s Selective Service Registration. She deserves a lot of credit for doing so. There is a new video out questioning the signature on the Selective Service form. The following article was presented at Citizen Wells on November 14, 2008.
breaking story from Debbie Schlussel of the debbieschlussel.com website. 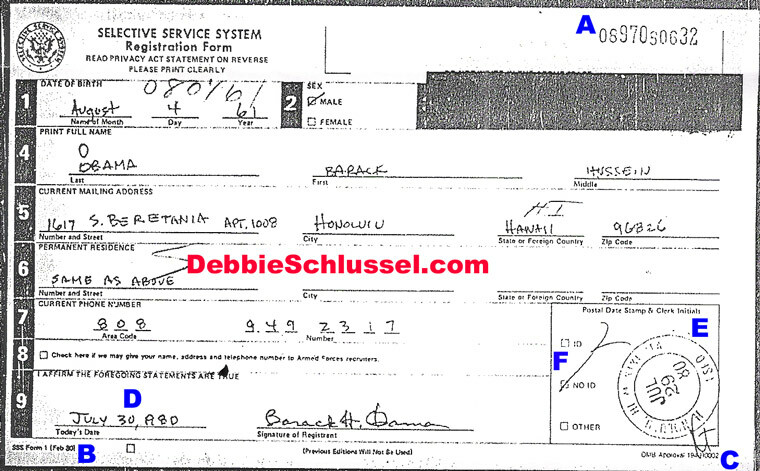 Debbie Schlussel revealed what are certainly irregularities on Barack Obama’s Selective Service Application as well as suspicious facts regarding accessing the record via a FOIA request. It was brought to my attention yesterday by a great commenter on this site, Lurker, that the signature on the Selective Service Application did not look like any others available for Obama (of course Obama has kept hidden many of his older records). Consider the following statement from Debbie Schluessel’s article and then compare the signatures below for yourself. Perhaps a handwriting expert can evaluate them and provide an analysis. “The Selective Service Data Mgt. Center Stonewalled for Almost a Year on Obama Registration, Until Right Before the Election. 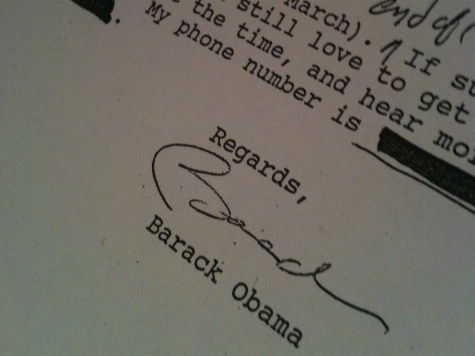 Obama signature on letter to professor Derrick Bell. The Obama campaign has accused Mitt Romney donors as being less than reputable. Are they on drugs! Wait a minute, they are. From ABC News April 20, 2012. “President Obama’s re-election campaign is circulating a list of eight “wealthy individuals with less-than-reputable records” who have donated to presumptive Republican nominee Mitt Romney. Team Obama alleges four men, who have each given more than $100,000 to support Romney and an affiliated super PAC, have benefited from “betting against America” – specifically through outsourcing. The list includes Paul Schorr, a partner at Blackstone Group, the nation’s largest private equity firm; investors Sam and Jeffrey Fox of the Harbour Group; and T. Martin Fiorentino, who has lobbied for Lender Processing Services, a firm that has been penalized by the government for its mortgage servicing and foreclosure practices. The Obama campaign also suggests that contributions from a group of deep-pocket “special-interest donors” are aimed at pushing a specific agenda, specifically on behalf of the U.S. oil industry. President Obama, unlike Romney, voluntarily discloses the names and contribution amounts of all his top volunteer fundraisers — “bundlers” — not just those who are registered lobbyists, as required by law. Obama also refuses donations from registered lobbyists or PACs. But Obama has received support from hundreds of wealthy Americans – including some with less-than-reputable records of their own. Former New Jersey Gov. and Obama bundler Jon Corzine has been under investigation for his role in the collapse of investment firm MF Global, where he was chairman and CEO and from which more than $1 billion disappeared. The Obama campaign and Democratic National Committee later announced they would refund more than $70,000 in contributions from Corzine and his wife. Officials said they would examine on a case by case basis whether to refund some of the more than $430,000 in additional funds Corzine delivered to the campaign from other supporters. In February, the Obama campaign refunded more than $200,000 from Carlos and Alberto Cardona after the New York Times reported the brothers’ ties to a Mexican casino magnate and fugitive from the U.S. who had sought a presidential pardon. Obama not only had numerous contributions from crime and corruption figures, he had long time associations with them and was complicit in some of the corruption. FEC audit reveals Obama for America failed to file notice of nearly 2 million dollars in contributions in 2008. 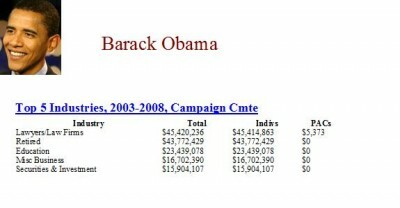 Check out the number 1 contribution industry to Obama in 2008. This is another reason you will never see tort reform as part of health care reform from a Obama regime. From WND April 26, 2012. Van Irion, whose Liberty Legal Foundation brought the case, alleges the plan by Tennessee Democrats to register Obama as their nominee for president opens a case, under state law, of negligent misrepresentation and fraud or intentional misrepresentation because of doubts about Obama’s eligibility. Irion was pleased the court recognized the significance of the claims. “The court made several very positive statements about our case,” he noted. “It is clear that the stated federal issue of President Obama’s qualifications for the office are ‘actually disputed and substantial,” the judge said. He told WND that the issue identified by Anderson is what virtually all of the dozens of cases challenging Obama’s eligibility have been seeking: a ruling on accusations that Obama is unqualified. Previously, cases have been dismissed based on standing or other technicalities, not on the merits. The decision from Anderson came in a case brought by Irion on behalf of voters and political candidates in Tennessee. The plaintiffs argue Obama’s name cannot be submitted because he is ineligible. The defendants had moved the case from state court, where Irion wanted to argue the state issues, to federal court, where Obama virtually has batted a thousand in preventing cases from reaching the point at which the merits are assessed. Irion had submitted a motion to have the case returned to the state courts, a request Anderson denied. But Irion was heartened by the comments from the judge, who said that without a determination on the questions facing the court, there easily could be differing results in court jurisdictions around the nation. “There is a risk of inconsistent adjudications on the federal issue presented,” the judge said. Irion also had raised questions about “Obama’s dual citizenship” and allegations that his Social Security number is fraudulent. “The court construes these allegations about President Obama … as corroboration of plaintiffs’ main allegation that President Obama is not a natural born citizen or otherwise qualified to be president,” the judge wrote. “It is undisputed that the material fact at issue in this case is whether under the circumstances of president Obama’s birth, the president is a ‘natural born citizen,’ a term set out in the United States Constitution and construed under federal law,” he wrote. The case is developing just as a new petition urges members of Congress to take the issue seriously by investigating it. The number of names on the document has surged past 40,000 and soon will be approaching 50,000. WND reported just a day ago that members of Congress, regarding Obama’s eligibility, still are relying on statements from Hawaii officials, “vetting” by voters and his own word. Obama released an image of a Hawaiian long-form birth certificate on April 27, 2011, after years of stating that the document was not available. But at that time, the Hawaii Department of Health and governor’s office refused to confirm for WND that the image released was an accurate representation of the state’s records. More on Natural Born Citizen from Citizen Wells December 28, 2008. Reprinted from Citizen Wells December 7, 2008. 2008 whether or not they will accept the case for a possible opinion or ruling. The Natural Born Citizen provision of the US Constitution as applicable to the 2008 election. US Constitution and Federal Election Laws. duty to uphold the US Constitution. Electors the leeway to make wise choices. “The cause of action first accrued on September 22, 2008, when Secretary Wells certified to county clerks, for ballot preparation, a written “statement”, prepared under her seal of office, that was required by statute to contain names of only those candidates who were “by law entitled” to be listed on ballots in New Jersey. The statement is demanded by N.J.S.A. 19:13-22. The law suit raises a novel contention that the statutory code undergoes legal fusion with the Secretary’s oath of office to uphold the US Constitution thereby creating a minimum standard of review based upon the “natural born citizen” requirement of Article 2, Section 1, and that the Supremacy clause of the Constitution would demand those requirements be resolved prior to the election. officials involved in presidential elections. Why does a judge swear to discharge his duties agreeably to the constitution of the United States, if that constitution forms no rule for his government? if it is closed upon him, and cannot be inspected by him? our Constitution and government intact.